The Invisible Man is Net Entertainment’s (NetEnt) science fiction slot, based on a thirties movie inspired by H. G. Well’s novel of 1897. The slot is packed with innovative features such as walking wilds, re-spins, and free spins, which allow players to win plenty of prizes. Playing The Invisible Man Slot is very easy as it is based on standard slots rules. The game comes with 20 paylines, and players should first select the number of paylines they would like to activate. The slot allows a maximum bet of 10 coins per activated payline. Since the coin values range from $0.01 to $0.50, players can bet as little as $0.01 to as much as $100.00. Once they place a bet, they only have to hit the Spin button to set the reels spinning. Players can now get paid for hitting winning combinations and unlocking bonus features. The Invisible Man is inspired by a classic movie of the early thirties, which is in turn inspired by H. G. Well’s science-fiction novel of the same name, published in 1897. The slot revolves around the tale of a crazy scientist who tries to find out how to become invisible. The slot features brilliant graphics, audio effects, and animations, and the reels feature icons of policemen, Griffin, the scientist, and high-value cards. The Invisible Man slot has three wild icons, which behaves in different ways. 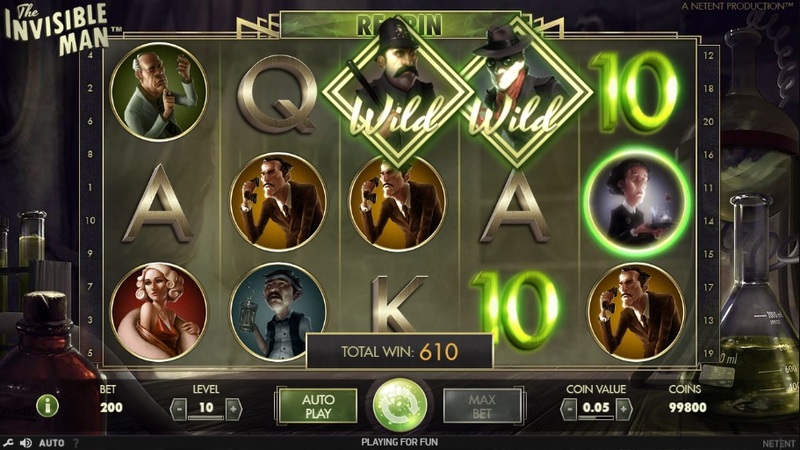 They are the Policeman wild icon, which appears only on the first reel, the Griffin wild icon, which appears only on the fifth reel, and the Burning wild icon, which appears only in the free spins feature. The Policeman wild icon and the Griffin wild icon remain active not only in the base game, but also in the free spins and the Police Spins feature. To activate the slot’s free spins round, the Griffin and the Police wild icons need to meet and merge. This is possible as they are both walking wilds, which move a position to the left or right with each spin. The free spins round comprises 10 free spins, which can be re-activated while playing a free spin. The feature is associated with a Griffin meter and a Police meter, which fills up as and when the Policeman wild icons and the Griffin wild icons appear on the reels. As soon as the spaces in the Police meter or the Griffin meter get filled up, the Police Spins Feature or the Griffins Rage Bonus Game get activated. The Police Spins Feature comes with 3 free spins with random burning wilds. In the Griffin’s Rage Bonus Game, players need to select a location to win multipliers and cash prizes. The Invisible Man is available for fun or real money at any NetEnt online casino.